With venture investments slowing down this year, what can we anticipate for the future? 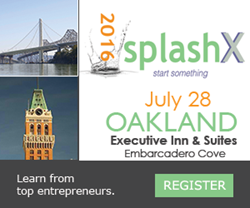 On Thursday, July 28, SplashX will present local entrepreneurs, media, civic leaders and world-class investors representing more than $40M of capital under management to the cozy Bayside Executive Inn & Suites in Embarcadero Cove in Oakland. SplashX is basically a mini-Splash. It is a short-and-sweet, three-hour evening program with two Keynote Splash Talks given by entrepreneurs from a particular area, in this case - the East Bay, as well as a panel of local VCs talking about the funding environment. Splash Talks are 20-minute TED-like talks about building, scaling and fundraising. TED Talks are "ideas worth spreading" whereas Splash Talks are "lessons worth learning. With venture investment slowing down this year, what can we anticipate for the future? A select panel of VCs will be on hand to share their concerns and their hopes. Some reality-check questions to be discussed: Are VCs asking startups tougher questions? Have valuations been slashed in half? Aren't the best startups born in the down times? The event will be a reality check and an enlightening discussion on innovation, as Oakland-based startups share their success stories on stage. As business continues to gravitate towards Oakland's growing tech community, there are considerable business opportunities for venture capital investors and startups because of our central location, diversity, and affordable rents. Though hindsight may be 20 x 20, foresight is invaluable! Stay informed about your community, your competition and your resources! VC funding has dried up, so how do you raise a round in this environment? Speaker: David Kaplan, CFO of 99designs, a fast-growing on-demand marketplace for freelance graphic designers. David helped raise $45 million in financing. M&A is on the rise; How to tee your company up for an acquisition. Speaker: John Hubinger, Managing Director, Spoke Ventures. John, whose former company AmberPoint was acquired by Oracle, will share his lessons about the M&A mating game and process. What's the state of the venture landscape and funding environment? With VC investments slowing down, how long will the slump continue and how many more startups and venture firms will die before year end; How are venture models changing? Is there anything being funded? Now that there isn't a glut of seed-stage startups looking for Series A, what's the role of the Post Seed investor? Is FinTech the only hot sector in 2016? Please request your press pass by July 27. Follow these links to the here.